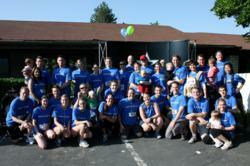 Over 50 NorthStar Alarm employees participate in local “Run to Walk” charity run for the Now I Can Foundation. This was our largest turn out yet, so we were thrilled to see so many come out and support these kids. Run to Walk is a celebratory day where every runner makes a difference in our children’s lives. NorthStar Alarm, one of the nation’s largest home security companies participated in Saturday’s Run to Walk 5K in Provo, Utah. The Run to Walk 5K is an annual event that the Now I Can Foundation organizes to raise funds for children who are in need of physical or intensive therapy. 53 NorthStar employees and family members showed their support for children with physical disabilities by running to raise money and awareness for the Now I Can Foundation. Now I Can is a nonprofit organization that offers physical therapy for children who are limited in their physical abilities. Their therapy center offers traditional physical therapy, intensive suit therapy, and feeding therapy. NorthStar Alarm Services, LLC, an authorized dealer of Honeywell Security Products, provides the most technologically-advanced and user-friendly home security systems on the market. Having the equipment, relationships, and reputation that families have been able to count on since NorthStar was founded in 2000, NorthStar continues to grow and protect residents in more than 20 states across the U.S. With a 24-7 support staff, Rapid Response monitoring, well-trained technicians, and professional consultants— NorthStar Alarm exists to provide security and peace of mind through quality products and superior service. For more information, please visit http://www.northstaralarm.com.